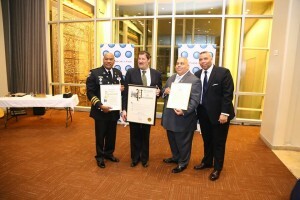 The first ever Menorah lighting at the United Nations was organized by Rabbi Yakov David Cohen, Director of the Institute of Noahide Code the sponsoring UN NGO, said “I am heartened coming into the United Nations Headquarters with the Isaiah Wall which prophesies that “no nation will wage war against another nation, and the swords will be transformed into plowshares.” This historic event involved the lighting of the Menorah by Rabbi Elie Abadie at the Isaiah Wall. The menorah is lit to commemorate religious freedom, when a small Jewish army fighting for religious freedom defeated the mightiest empire of the time: The greeks, who were attempting to quash religious observance. 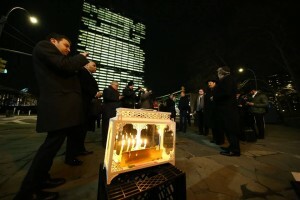 During the lighting the names of the 11 Jews killed during the Pittsburgh synagogue massacre were read, then Rabbi Cohen spoke about “The fifth night of Hanukkah is the first night in which a majority of the lights on the Menorah are lit, this is the night in which the light overcomes the darkness, it is up to all of us whether Jewish or Gentile, White or Black, Hispanic or Asian, to add in light and make this world a better place. Then participants danced and sang traditional Hanukkah songs including “Maoz Tzur”. 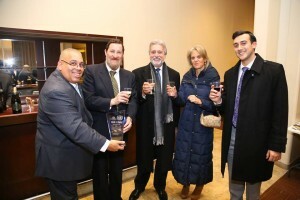 Then The Grand Chanukah Ball was held at the UN express Bar just steps away from the general assembly hall, in attendance were Ambassadors and UN staff. 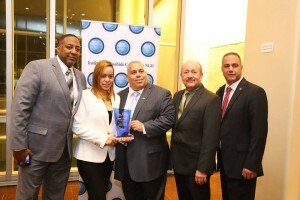 NYC advocate Clark Pena Received the Ambassador of peace award for his work on peace. 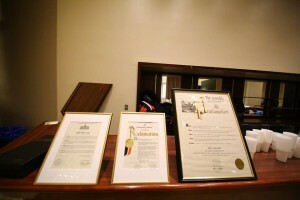 Then Mr. Pena presented Rabbi Cohen with a proclamations from the New York State assembly as well as from New York City Council recognizing Rabbi Cohen’s work on promoting peace and unity in the world. The United Nations acknowledges human rights as well as humanity’s right to freedom, including that of religion. 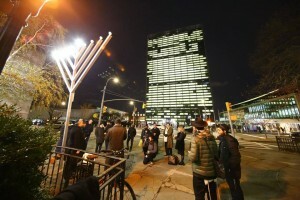 This Menorah lighting ceremony was open to all, including visitors to the United Nations of all races, religions and ethnicities. It was a celebration of all that unites us as human family that we are: our yearning for ever more light at a time that humanity hopefully emerges victorious with light over darkness, the forces of human rights and freedom successful over intolerance, and the ideals of the Noahide Laws prevailing throughout the world. The Seven Universal Laws of Noah are means by which humanity strives to live in unity and peace. These laws for peace and unity encompass respect for G-d, for human life, respect for the Family, for other people’s property, the creation and respect of a judicial system, and respect for all creatures and environment.